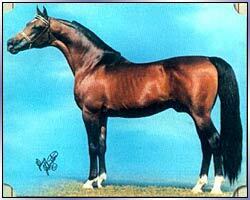 BASK ++ is the only stallion to be a U.S. National Champion Stallion and Park Horse and is the breed`s all time leading sire of champions and National winners, as well as National winner producers. Bred by Albigowa State Stud, Poland. *Bask began his race training in Poland at the age of two. He remained in the racing program for a full four years. Out of 40 races, he placed first eight times, second seven times and was third seven times. Exported in 1963 to Lasma Arabians, USA.